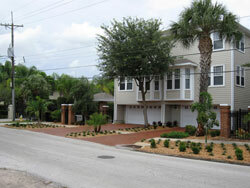 Evergreen Total Landscape has a full staff of experienced Tampa landscapers that can perform a wide variety of services. Customers in Tampa have trusted our company for more than 25 years because we take a proactive approach to every landscaping job we perform. We actively manage the sites we maintain with frequent inspections, ensuring that the land continues to look pristine and that any problems are addressed quickly and efficiently. All of our services feature an unmatched level of value because they’re performed by a team of highly skilled professional landscape technicians. Our customers can rest assured that they won’t have to worry about plants growing out of control, not being in a position for adequate sunlight, needing frequent replacement, or other costly annoyances that often result from inexperienced landscaping companies. At Evergreen, we got the job done right the first time. If you would like additional information about our Tampa landscapers, please call or e-mail Evergreen Total Landscape today. Our services are also available to customers in surrounding cities, including St Petersburg, Lakeland, Clearwater, and beyond.